People light-up candles and deposit flowers during a gathering around a makeshift memorial at Place Kleber, in Strasbourg, on Dec. 16, 2018 to pay a tribute to the victims of Strasbourg's attack. A memorial is being held at a square in the eastern French city of Strasbourg to remember the four people who were shot dead and the dozen who were wounded by a gunman several days ago. The gathering Sunday morning was in Kleber Square by the city's famed Christmas market, near where the gunman opened fire Tuesday evening. FILE - Police secures area where a suspect is sought after a shooting in Strasbourg, France, Dec. 11, 2018. 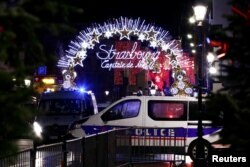 French authorities launched a massive manhunt after the attack that ended Thursday night when the main suspect, Strasbourg-born Cherif Chekatt, 29, was killed in a shootout with police in the city neighborhood where he grew up. French authorities are still investigating the Strasbourg Christmas market attack. Chekatt's parents and his two brothers, who had been held by police for questioning for several days, were released on Saturday.